Advertising Poster for travel to Czechoslovakia (country founded in 1918 after the end of WWI, and dissolved with the fall of the USSR in 1993). Today, they’re referred to as two separate countries, Czech Republic & Slovakia. This poster is meant for the American public. Pictured is a gorgeous winter scene of the Low Tatras mountain region. On the bottom of the poster is a Route-Map from various Western European areas. The highest mountain in the Low Tatra range is the ‘Dumbier’, which is the specific mountain pictured. At the bottom in All-Caps is the Railway Company’s New York City office address. 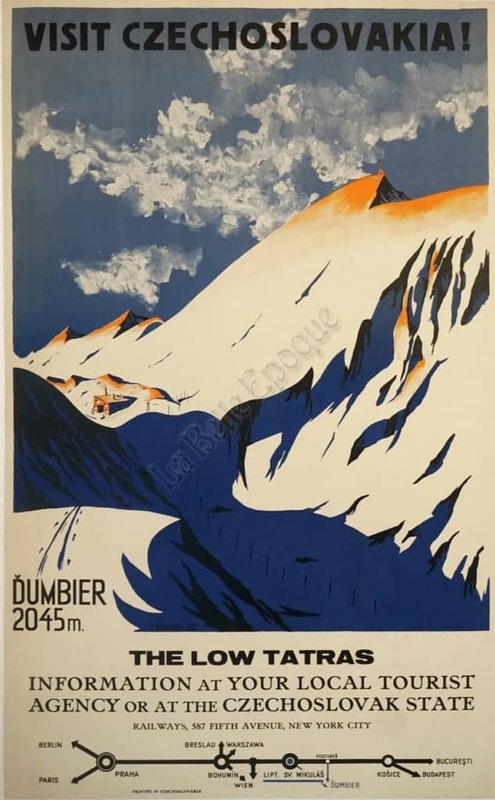 The poster is primarily blue and off-white, with orange at the mountain’s peak.